On Saturday I braved some very cold weather to attend an unofficial downtown budget consultation meeting at City Hall. Held by councillors Pam McConnell, Adam Vaughan and Kristyn Wong-Tam — with an animated Shelley Carroll as a special guest –, the (unfortunately under-publicized) event was eye-opening. The presentation given by the host councillors is available for download. It’s a PDF file. It’s well worth giving the whole thing a read, particularly for residents of Wards 20, 27 and 28 as it includes a list of ‘safe’ projects in those areas. However, I know not everyone geeks out over city finances like I do so I’ve pulled a few key slides and embedded them below. 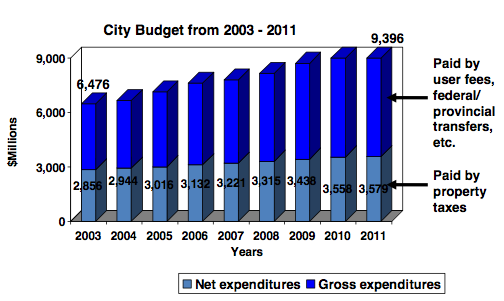 Taken together, these three graphs paint a compelling picture of the real state of the City of Toronto’s finances. 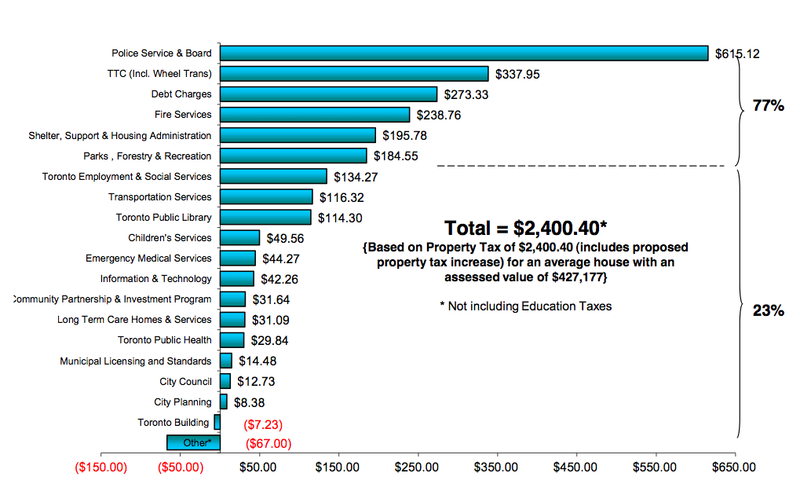 The big disparity to note here is the property tax slice of the pie. Nearly 40% of the city’s revenue for its operating budget comes from property taxes, more than double the percentage seen south of the border. 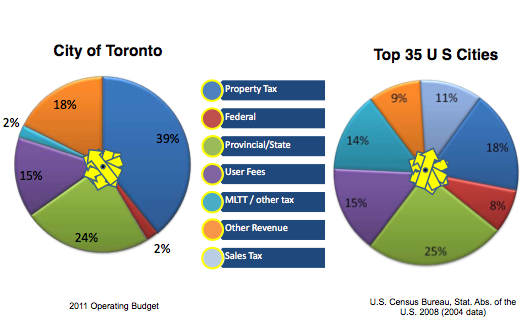 The City of Toronto Act, ushered in a few years back, was supposed to allow the city to increase revenues through other means. You may have heard that this strategy was slightly unpopular. Also worth noting is that, in contrast to American cities, our city gets no revenue from any kind of sales tax and we have a federal government that is seemingly unwilling to provide municipal funding. If the federal government quadrupled its annual contributions, bringing them to the same level as the U.S. average, the city would generate an extra 800 million dollars for the operating budget this year. Click this one for bigger. This is where the Mayor’s “the city has a spending problem, not a revenue problem” rhetoric gets destroyed. 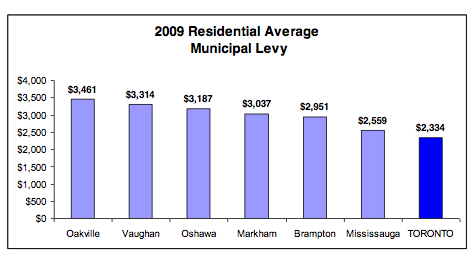 The above shows where revenue from the average property tax bill goes. More than three quarters of that revenue is used to pay for things that generally can’t be cut. Either they’re provincially mandated (housing) or involve arbitrated labour contracts (police, fire, soon TTC). The amount the city must pay for debt charges every year is concerning, but keep in mind that the city can only use debt to finance capital projects. In 2011, 83% of capital expenditures went to either ‘State of Good Repair’ projects — ie. keeping things from exploding — or growth expenses related to increased population. The councillors at the downtown budget meeting warned that battles would be fought over very very small pieces of the budget, particularly Community Partnership & Investment Programs. These cuts are more ideological than anything else, since they make little impact on the bottom line. My conclusion at the meeting, after Oh god we’re doomed, was that the current budget process amounts to little more than theatre. Even if the conservative wing of council is successfully in cutting all the expenditures they’re targeting, we’re still left with mounting core costs that will inevitably require a combination of steep residential property tax increases and an improved funding formula with the other levels of government. Put another way: even if the city solves its mythic spending problem, we still have a revenue problem. This entry was posted on Monday, January 24th, 2011 at 9:00 am	and is filed under feature. You can follow any comments to this entry through the RSS 2.0 feed. Both comments and pings are currently closed.